Truth be told I like all kinds of squash. 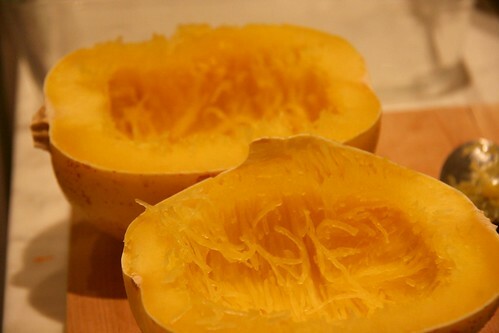 But spaghetti squash is one of my favorites. It has a light flavor and crunchy texture when cooked. It makes a simple side dish or a main with some pasta sauce. 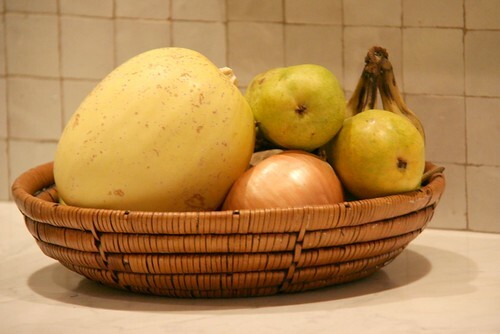 The funny thing about spaghetti squash is that even though it is so simple to prepare most people I know have never tried it. Have you? I feel lucky my mom introduced me to it. Next time you're in the grocery store and you see the display of assorted squash(es?) 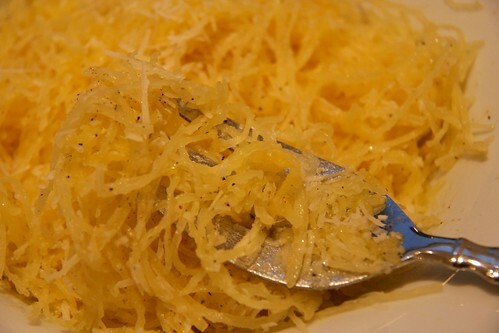 pick up a spaghetti squash and give it a try. It is so easy to prepare and very delicious to eat. Prick your squash a few times with a fork. You won't be able to prick it very deeply as the squash is so hard. Don't worry about it. Stick in in the microwave for 8 minutes on high power. Check it after 8 minutes. If it is slightly soft take it out and slice it in half. If not, keep it in the microwave until it is - 1-5 more minutes. After you've sliced it in half, scoop out the "guts" and put it in the microwave for 5 more minutes. Check it again. The inside should easily shred into "noodles." They should be tender with a slight crunch. Keep microwaving 1-2 minutes at a time until this consistency is reached. 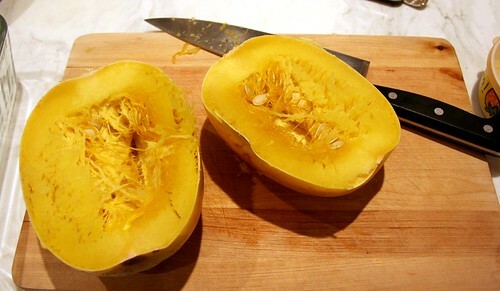 When the squash is done take a fork and shred the interior into "noodles." The girls and I tried to fool Bryce into eating it by contending it was pasta! 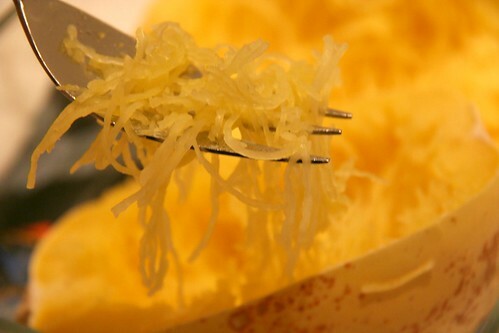 If you have a favorite way to eat spaghetti squash please leave a comment. I'd love to hear about it. that is amazing and something I've never seen here! We dont have squash in australia but Ive been told what we call pumpkins (usually butternut pumpkins are kinda like your squash)I wonder if I can do that with our ones. It really does look like spaghetti! Here pumpkin is very popular roasted served with roast meat and veg (nearly always have roast potato and pumpkin with roast) and pumpkin soup is very very popular and something I make weekly in winter (and its a cheap way to feed the family) we also do pumpkin scones (biscuits? )roasted pumpkin peices are popular in salads and pasta dishes too. I like it in cous cous salad.. yum! So there are a few ideas to use up your squash with! 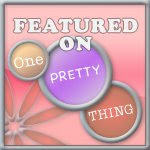 Thanks for the great comment! I remember our English friends spoke of pumpkin too, not squash. I love squash (pumpkin to you) soup - haven't had it in quite a while. I'll have to make it, tis the season.